Double Prize Draw: Win a Motorised Slider with Videvo this Christmas! Following the success of the previous competition in July, we’re excited to announce that during December we’ll be giving away not one, but two Motorized Slider Kits courtesy of our amazing sponsor Digislider! The model of the Sliders will be the 100cm version of the Video & Timelapse Motion Control Kit. One thing to note, this package does NOT include the intervalometer. Read on to find out more about how you can win one of these great little sliders for Christmas. – Between midnight on December 1st (EST) and midnight December 25th (EST) 2014, any clip you upload to Videvo will count as one entry to the prize draw (footage or motion graphics). – You may upload as many clips as you like, but only clips that are accepted by our moderators will be counted. – Each clip counts as one entry, so the more clips you upload the higher your chances will be of winning. 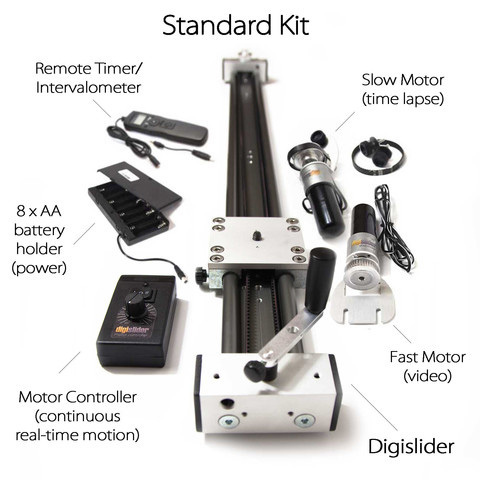 – The user who uploads the most clips will instantly win the first Digislider Motorized Slider Kit. – On Christmas Day, we will randomly select a clip and the author of that clip will win the second Digislider Motorized Slider kit (this is completely random, and not judged on artistic merit). – The user who uploads the most clips (winner of the first kit) will not be counted in the random prize draw. As mentioned above, only clips that are accepted by our moderators will be counted. For more information on uploading to Videvo, please click here. Clips uploaded before or after the contest period (exact timings will be based on Eastern Standard Time) will not be counted. The model of the Slider will be the 100cm version of the Video & Timelapse Motion Control Kit. The contest includes free postage to anywhere in the world (within reason). We wish you all the best with the contest and we look forward to seeing your entries.